Poetry Please and lunch at the Fox and Hounds. Home → Home page latest news → Poetry Please and lunch at the Fox and Hounds. 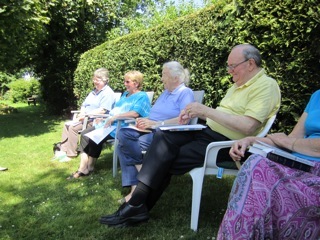 On Tuesday morning, 9th July, twelve people gathered in the garden of 85 Main Street to bringing their favourite poems to read and share. 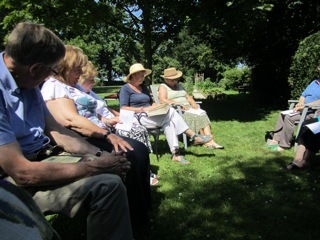 Settling down with a cup of coffee or glass of elderflower cordial in the hot sunshine we heard a very wide range of poems, some long-established favourites but some lesser known ones too. We heard reasons why a poem was a favourite or how it first came to notice. Some were long-time favourites and some were found in recent reading. The choices were wide, from the childhood favourite, A A Milne, through Pam Ayres to Laurie Lee, Walt Whitman and Robert Frost and there were several discussion about the themes and relevance of the poems. Lois Jordan impressed everybody by faultlessly reciting, from memory, two long poems, The Duck, by Frank W Harvey and The Song of Right and Wrong, by G K Chesterton, learned as a schoolgirl, if I may say, more than a few years ago. John De Val delighted everybody with his two choices from Rupert Brooke, Dining-Room Tea, which spoke of the pleasure and importance of being with friends and The Old Vicarage – Granchester, which was a very fitting poem to conclude the readings and drift over to the Fox and Hounds to enjoy an excellent lunch. It was a lovely occasion and, as it was so enjoyable, there was a conversation about arranging a similar event later. Thanks to all those who came to take part.